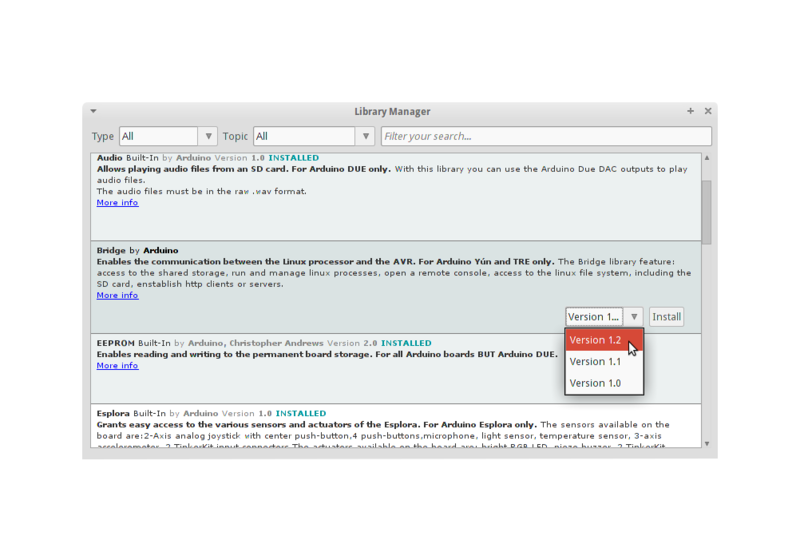 To install a new library into your Arduino IDE you can use the Library Manager (available from IDE version 1.6.2). Open the IDE and click to the "Sketch" menu and then Include Library > Manage Libraries. Then the Library Manager will open and you will find a list of libraries that are already installed or ready for installation. 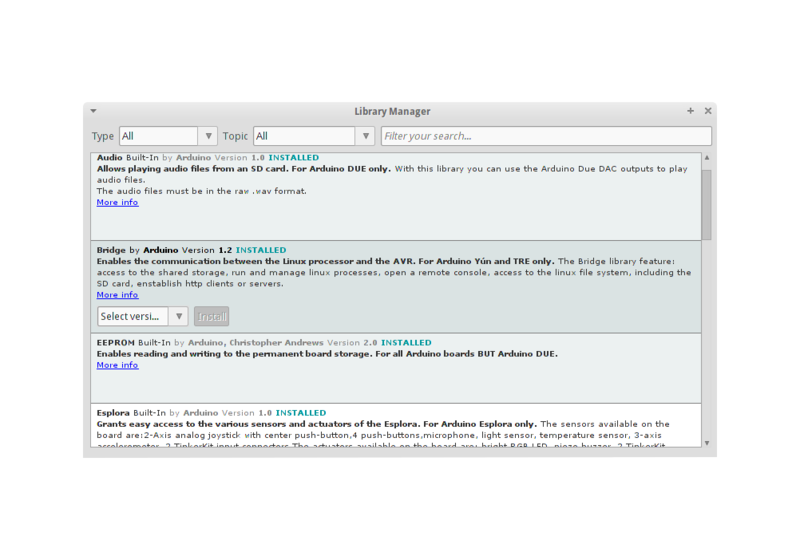 In this example we will install the Bridge library. Scroll the list to find it, click on it, then select the version of the library you want to install. Sometimes only one version of the library is available. If the version selection menu does not appear, don't worry: it is normal. You can now find the new library available in the Sketch > Include Library menu. If you want to add your own library to Library Manager, follow these instructions. 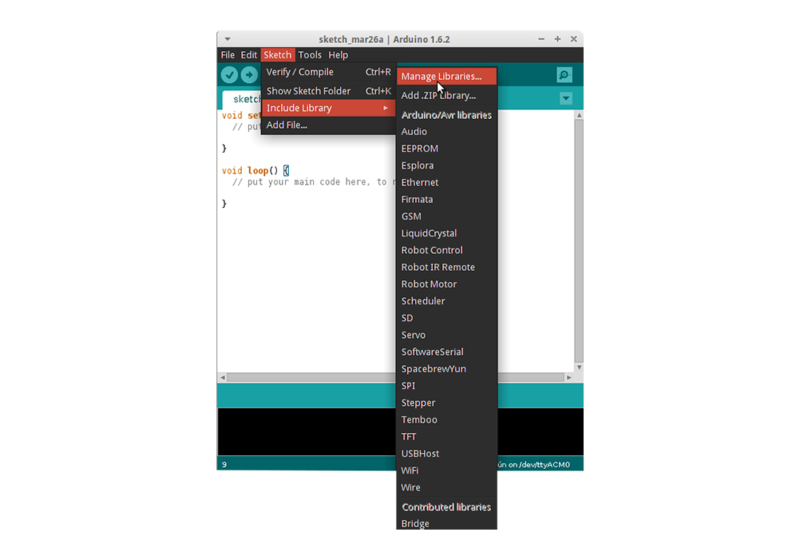 In the Arduino IDE, navigate to Sketch > Include Library > Add .ZIP Library. At the top of the drop down list, select the option to "Add .ZIP Library''. You will be prompted to select the library you would like to add. Navigate to the .zip file's location and open it. Return to the Sketch > Include Library menu. menu. You should now see the library at the bottom of the drop-down menu. It is ready to be used in your sketch. 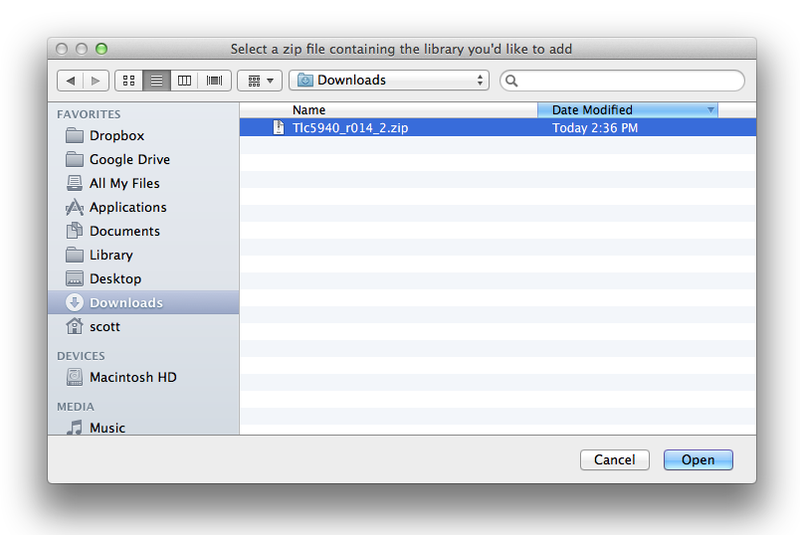 The zip file will have been expanded in the libraries folder in your Arduino sketches directory. NB: the Library will be available to use in sketches, but with older IDE versions examples for the library will not be exposed in the File > Examples until after the IDE has restarted. You can find or change the location of your sketchbook folder at File > Preferences > Sketchbook location. Start the Arduino Software (IDE), go to Sketch > Include Library. Verify that the library you just added is available in the list. Please note: Arduino libraries are managed in three different places: inside the IDE installation folder, inside the core folder and in the libraries folder inside your sketchbook. The way libraries are chosen during compilation is designed to allow the update of libraries present in the distribution. This means that placing a library in the “libraries” folder in your sketchbook overrides the other libraries versions. 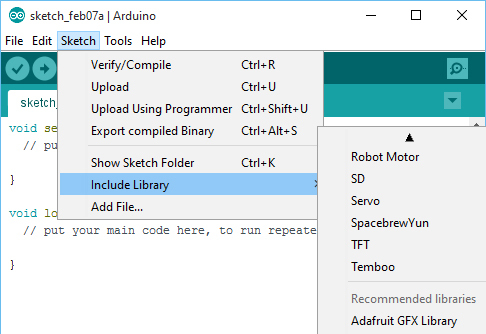 This is why we recommend that you only install libraries to the sketchbook folder so they are not deleted during the Arduino IDE update process.